The place to talk about Stella4D, Great Stella, and Small Stella. Feel free to ask questions about them here. What is the geometric shape of the London Gerkin? Where can I obtain the net? Looking on the internet I see that it is more commonly known as the 'Gherkin'. You can start with an 18-fold antiprism. You subdivide the faces and create a frustum (a "truncated pyramid" or a prism where one base face has a smaller diameter than the other one). You put this into the memory and you can deform it by nonuniform scale along the rotation axis. Repeating augmentation with such pieces gives a gherkin-like model For the top you augment a flat pyramid. You really have encouraged me! I am a retired engineer and love creating models from exocitic woods. I have 'posted' one or two of my models, on this forum, earlier this year. However, I have to admit my rather limited knowledge of this type of geometry. O.K...... I have made a 18 fold antiprisim! How, exactly, do I subdivide the faces and create a 'truncated pyramid' ? If you could walk me through the process, step by step, of creating a 'net' for the shape you kindly included in your posting I would be very, very indebted to you. make sure that the vertices are visible by hitting the "v"-key. Choose a 2-window-layout by hitting Ctrl+2, left window normal view, right window Faceting preview. Then click on "subdivide faces" in the "Poly"-menu. Enter e.g. "9". Choose 18-fold pyramidal for the symmetry and the "faceting mode". Create an 18-gon from the original vertices at the bottom and a smaller 18-gon from the first ring of points at the top, then the lateral triangles. Hit Shift+Ctrl+F to create the faceted polyhedron. Put the model into the memory by hitting "m" and chosing "memory 1". Click on "nonuniform scale" in the "scale"-menu and enter e.g. 1.1. Select the top 18-gon and put this model into memory 2. Retrieve the model from memory 1 and select the bottom 18-gon, then augment this face by the model in memory 2 ("a"-key, select the memory required, click on "ok" and hit "Return"). Put this model into memory 1, retrieve the model from memory 2, rescale it in a similar manner like before, select the top face and put it into memory 2 again before you augment the other one like before. In this way, you can create a kind of Gherkin by trial and error. You can always undo your steps if the result isn't like you want it to be. On the top, you augment the small 18-gon by a pyramid, the height of which you can change hitting the Ctrl-key and dragging the mouse. The real Swiss Re Building seems to have a parabola like the hull curve, so you might wish to calculate the exact heights (and slopes) of your frustums, but that's a lot of work to do. Last edited by Ulrich on Wed May 07, 2008 5:58 am, edited 1 time in total. However, I must be rather stupid! How do I get my right window into Faceting Preview? 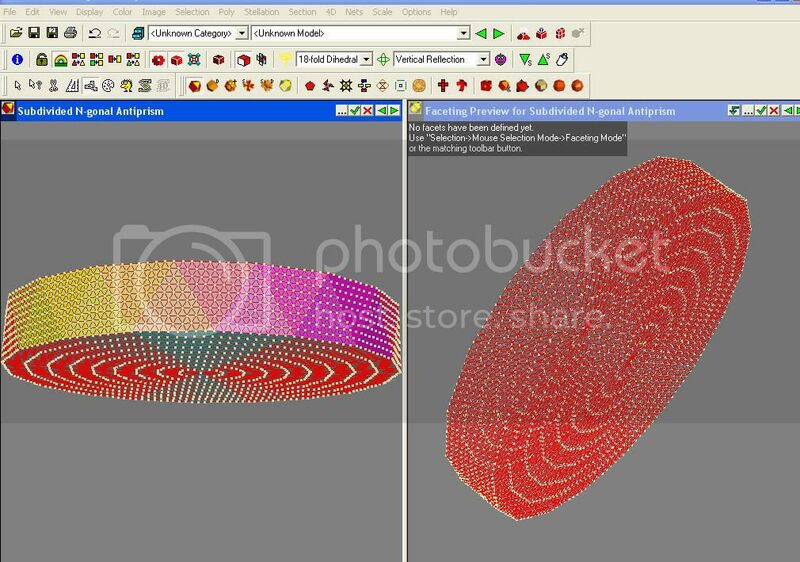 To create a facet you click on the faceting mode symbol (left besides the little palette), you hit the Shift key, you (left-)click on the vertices desired and you right-click to get the facet. If all edges are in pairs, you can create the model. That is absolutely wonderful Ulrich! My problem is that I am not very familiar with the Stella software.... I like to use the software to give me the 'mitre angles' and 'edge lengths' but really my skill is more in the direction of making the precision wood parts needed to assemble these different shapes. I will struggle along a little more ...... please be very patient with me. 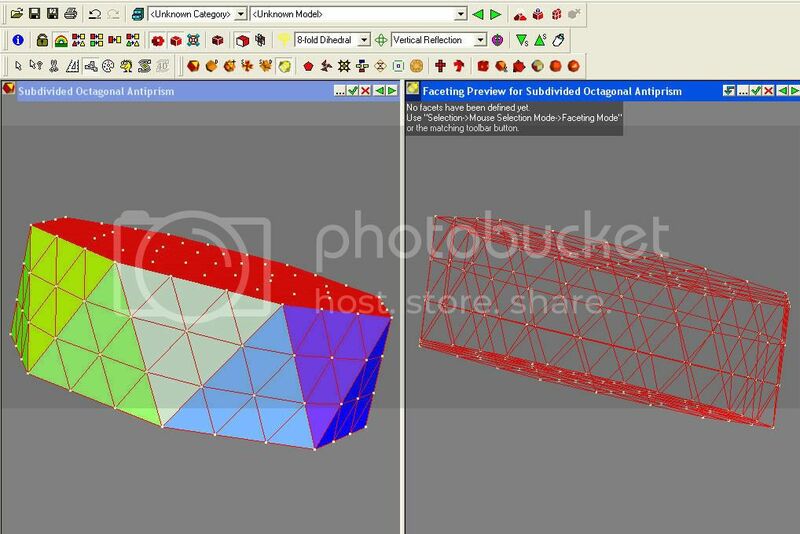 Ctrl+Right-drag (change the radius of the top of the model being added when using a cupola, prism, or antiprism) features. So don't struggle too much, just keep playing with the tools. Last edited by Ulrich on Thu May 08, 2008 5:50 am, edited 1 time in total. I will be away from my computer for the next two to three weeks ... then ... on my return I wish to really get to grips with the designs for the London Gherkin. Roughly, I would like the finished model to be about one metre high with the different panels constructed from Mahogany, Cherry and Walnut.... Roughly following the design of the actual Gherkin. If a fourth 'colour' is needed then I would use some Oak. From experience .... I do not wish to construct individual panels with side measurements that are less than 50mm. Keeping the sizes resonably large then I seem to be able to maintain the required degree of accuracy. Please Ulrich.... or anybody kind enough to help a 'struggler'! How do I get '18 Fold Pyramidical' in the 'Symmetry' box. Found the 18 Fold View ... Now what? I have now got so far with this project.... Is this correct? Now.... How do I created an 18-gon from the original vertices at the top and a smaller 18-gon from the first ring of points at the top , then the lateral triangles? Re: Found the 18 Fold View ... Now what? Squeaky wrote: How do I created an 18-gon from the original vertices at the top and a smaller 18-gon from the first ring of points at the top , then the lateral triangles? Now you can use Shift+Left-click on successive vertices to create new faces, then use Shift+Right-click when you've finished a face (or click on the tick button or just hit Enter). I just wish I could get really going on this project. Can you please look at my 'shape'.... the one that I posted this morning then, step by step, explain what I do next. How do I create an 18-gon? 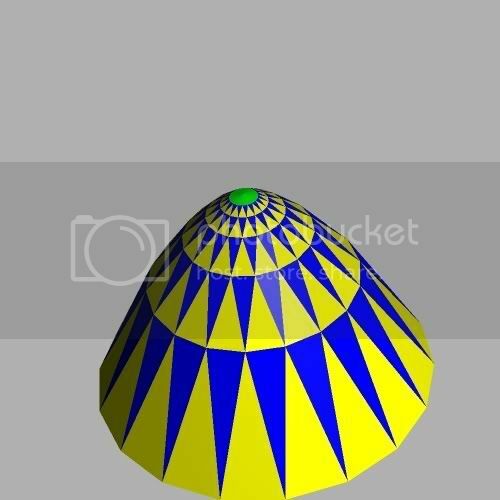 I would like to create a truncated pyramid from the above octagonal antiprism. 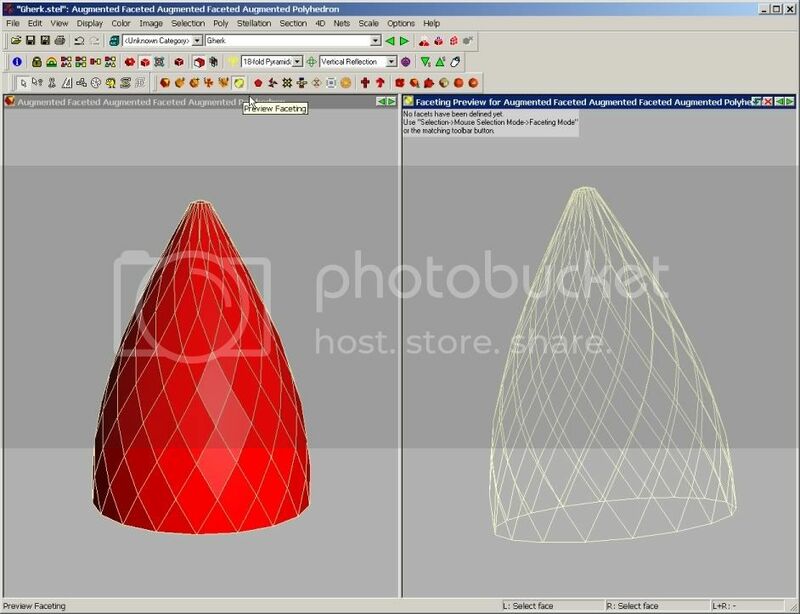 How, exactly, do I select all the facets from the right hand view and create a truncated pyramid?